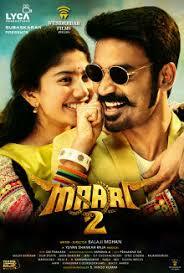 Maari 2 (2018) As shown in the first part, Maari is an undisputed don in his area. He is best friends with Jagan and always obstructs drug deals in his gang. But this does not go well with rival gangs who join hands with Jagan’s brother and try to continue the business. This is also the time when a criminal named Bijju tries to kill Maari. Who is this Bijju? What is his animosity with Maari? and where does Sai Pallavi feature in this setup? That forms the rest of the story.. Despite The Presence Of A Good Star Cast And Technical Team, Balaji Mohan Yet Again Fails To Impress And..
On The Whole, Maari 2 Does Not Create The Effect Which The First Part Did. Sai Pallavi And Dhanush’s..